The Aaron Rodgers train is chugging with a full head of steam, but he didn’t take the fast track to get here. He had the misfortune of being drafted by the Packers during the tenor of another NFL legend, QB Brett Favre. Selected 24th overall in the 2005 draft, Rodgers was relegated to backup duty and did not see much game action while his predecessor still manned the quarterback position for The Pack. 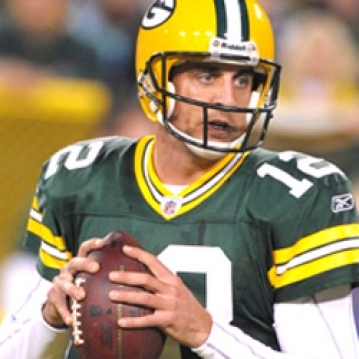 It was not until 2008, when Green Bay management became fed up with Favre’s retirement indecisiveness, that it was decided that Rodgers had earned his role as starting quarterback and leader of The Pack. With three years already under his belt, Aaron hit the ground running. 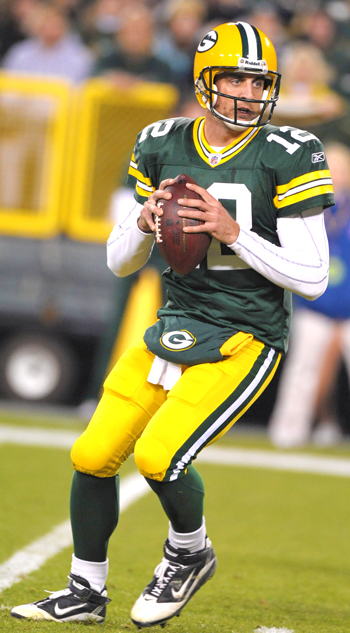 Rodgers became a legend in the eyes of all Packers fans by leading their team to the Promised Land last season. In only his third year as starting QB, Rodgers won it all. He did not allow his trip to Disney World to distract him from improving and becoming a dominant quarterback in the NFL. This year, Rodgers has done nothing but throw touchdowns and win football games. He has thrown 39 TDs in 13 games…averaging three TDs per game! He has achieved this remarkable feat while throwing only six interceptions and has added to his touchdown total by running in two more. Perhaps his most impressive accomplishment this year, Rodgers is compiling yardage by the mile and is on pace to challenge the NFL record. Dan Marino is undoubtedly a NFL legend. He also became a heroic icon here in South Florida by dominating as the quarterback of the Miami Dolphins for 16 years. He set the bar for NFL quarterbacks by setting the single season passing record, which has stood for nearly three decades. Since 1984, no player has been able to eclipse Marino’s mark of 5,084 yards in a single season. Rodgers has thrown 4,125 yards to date and still has three games to play. So far he has averaged 317.3 yards/game and at that rate would throw 952 more yards. That would bring his total to 5,077 yards, only seven yards shy of Marino’s record. Reaching the record books just got a bit more challenging for Rodgers. During their week 14 game vs. Oakland, The Pack lost their premier wide receiver, Greg Jennings, to a knee injury. Jennings’ injury will likely keep him out for the rest of the regular season, as the team won’t rush him back with the playoffs looming. But with Dan Marino’s record in his sights, Aaron Rodgers will not only be targeting the record books but will also be striving for perfection by leading The Pack to a perfect 16-0 season. ‘Tis the SeasonPass On Some Stuffing This YearBoss or Leader?